The MCC Washington Office celebrates 50 years with a commemorative newsletter. The MCC U.S. Washington Office celebrates 50 years! This summer, our office will celebrate 50 years since its founding in 1968. This spring's special edition of our print newsletter takes a look back at the Washington Office's work over the past 50 years. Read it here or download the PDF version. Join us Tuesday, July 17 as we celebrate with an open house and reception. Register here. Criminal justice: President Trump held a White House Prison Reform Summit on May 18. The president expressed support for reentry initiatives such as employment access and drug treatment to reduce recidivism rates. Immigration: Hundreds of children are being forcibly separated from parents at the U.S.-Mexico border under a new “zero tolerance” policy (action alert). Read more about the new family separation policy, a Mennonite Brethren pastor in California who could be deported, the latest status of Dreamer legislation and more in the May 31 immigration update. Palestine and Israel: On May 14, the U.S. moved its embassy from Tel Aviv to Jerusalem—the same day that Israeli soldiers opened fire on protesters in Gaza. The use of lethal force was condemned by some members of Congress. Separately, 13 senators raised concerns about Gaza’s humanitarian crisis. In addition, 76 members of the House sent a letter raising concerns about Israeli settlements and demolition orders against Palestinian villages. Take action. Photo: "I miss you, Mom. I love you so much. You and I have to be strong, Mom. I want you to come out, Mommy, because I miss you. Mom, I love you a lot. I miss my little brothers, too. 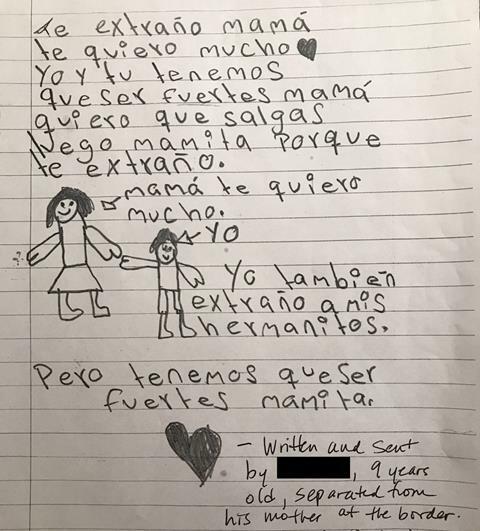 But we have to be strong, Mommy.” Letter written by a 9-year-old boy to his mother, from whom he was separated at the border. 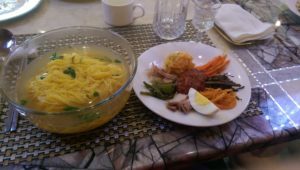 Korea Peace Network Advocacy Days – Join peace advocates in D.C. for a day-long conference and strategy meeting followed by a day on Capitol Hill to promote peace and engagement between the U.S. and North Korea. Register here. Join Mennonite Central Committee for a "Healthy masculinity" webinar. During Reentry Awareness Month, MCC will present an interactive learning tool and lead a discussion on criminal justice in Philadelphia, PA. Register here. Join the Washington Office as we celebrate 50 years. Register here. A warm welcome to Xin-Dee Low and Whitney Ricker who are joining us for internships this summer. Xin-Dee, a student at Messiah College, will focus on international affairs. Whitney's internship is through the Center for Sustainable Climate Solutions and will focus on climate change. On May 8-9, Charles Kwuelum hosted pastors Nehemiah Chigoji (Upland Peace Church, Calif.) and Hilarie Louis Jean (Church of God Prince of Peace, Miami), for an event to advocate for more poverty-focused development assistance. On May 22, our office hosted a Mennonite Church USA advocacy delegation, as follow up to the 2017 “Seeking Peace in Israel and Palestine” resolution. The group met with 14 congressional offices. Charissa Zehr participated in the Haiti Clean Water panel hosted by the United Nations Association of the National Capital Area (UNA-NCA), speaking about cholera justice and MCC’s Haiti advocacy.